An enterprising Australian interactive media company has created a world-first touchscreen portal that allows consumers to “chat” with brands and buy or sample their products exactly when and where they want them. The company has reimagined the traditional vending machine for today’s screen and socialmedia obsessed culture by designing digital touchscreen portals that not only deliver sales or product trial but can also gather instant, valuable consumer data for brands – bringing them closer to their customers. An enterprising Australian interactive media company has created a world-first touchscreen portal that allows consumers to “chat” with brands and buy or sample their products exactly when and where they want them. The company has reimagined the traditional vending machine for today’s screen and socialmedia obsessed culture by designing digital touchscreen portals that not only deliver sales or product trial but can also gather instant, valuable consumer data for brands – bringing them closer to their customers. 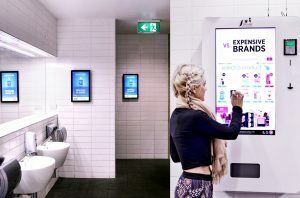 Powder Room Interactive Media (PRIM) has signed up a growing number of major brands keen to tap into its exclusive network of 300 retail portals and digital displays at Australian airports located across the country which currently reach 280,000 people each day. The digital portals feature 32-inch HD LCD interactive touchscreens with app-style software that have the ability to run TVCs with audio, display point of sale and product content as well as allow simple “tap and go” credit card or cash transactions, a customer-focused application for today’s cashless society. Leading FMCG brands such as Colgate-Palmolive, Blackmores, Unilever, Johnson & Johnson, Nivea have jumped on board to use the innovative sales and marketing tool as part of larger marketing campaigns or bespoke executions, tapping into PRIM’s extensive national network. As the out-of-home advertising industry booms, fueled by digital technology, marketing managers are increasingly seeking out opportunities to make their out-of-home work harder, looking for solutions that allow campaign customistion for the time of day, different geographical markets as well as testing on creative or even price – offering them valuable insight on who their consumer is, the content they respond to and how to best interact with them. The advantage of interactive out-of-home technology for trialing products is consumers are actively requesting trial samples, which eliminates the wastage of traditional sampling. It also gets the products into the consumer’s hands in real time, unlike product giveaways offered through websites or digital advertising. PRIM managing director and founder Michelle Davis said the opportunity for brands to create moments that give consumers what they need and want at the right time and place is endless through the development of this new out-of-home technology which allows instant access to a network of over two million customers per week. “Product sampling has been stuck in the same stagnant place for so many years and our vision for Powder Room Interactive Media, through embracing digital and data, was to shake up the industry and transform this space so it’s consumer-first and futureorientated,” said Davis. “We know brands want to establish a closer, more targeted connection with consumers in the out-of-home environment and similarly consumers aren’t as receptive when they don’t seek out the interaction, so our interactive digital portals create the perfect storm for these two opportunities to converge,” she said. Following PRIM’s success at Australian terminals, the company has been approached by airports in the United States, Europe and South Africa to bring the technology to their shores. PRIM is also rapidly expanding its national presence to shopping centres by providing a customised application for parents’ rooms providing products tailored for the baby and toddler market. The technology offers a novel approach to brand activations at major sporting events or music festivals, demonstrating the multitude of experiential and retail executions also available to brands and advertisers. PRIM served up a marketing hit for Blackmores with a customised activation utilising artificial intelligence for its Well Bot campaign at the Australian Open in January this year. Eight interactive portals created a buzz with consumers who engaged in entertaining conversations about their health and wellbeing and received tailored vitamin samples as a reward. Davis founded PRIM in 2014 following a successful career in sales and marketing. Her passion for travel lead her to discover a gap in the market for quality, accessible beauty and grooming essentials for people on the go. “It was a bit of an ‘ah ha’ moment – the opportunity to bring a quality range of products into airport ‘powder rooms’ while at the same time opening up this market to leading brands who were seeking meaningful connections with their consumers just made so much sense to me,” explained Davis.